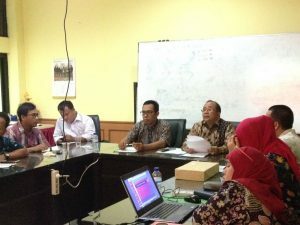 Rectorate, UIN News Online â€“ Based on Presidential Regulation No. 81/2010, concerning the Grand Design of Bureaucracy Reform which regulates the Implementation of Bureaucratic Reform Program and of PAN and RB Ministerial Regulation no. 52 of 2014 on Development of Integrity Zone Toward a Free Area of Corruption and Clean Bureaucracy in the Government Institution Environment, UIN Jakarta has prepared strategic measures in the form of Strengthening the integrity zone development. This was conveyed by UIN Jakarta AUK Bureau Chief Dr Rudi Subiantoro MSi during office meeting of UIN Jakarta Organization, Personnel and Legislation Division, raising the theme on â€œSosialisasi Pelaksanaan Pakta Integritas Pegawai UIN Syarif Hidayatullah Jakartaâ€ at AUK Buereau meeting room, Friday, (7/28). In his presentation, Rudi said that there are 9 programs that will be implemented in order to accelerate the bureaucratic reform, such as organizational structuring, distribution of civil servants, better selection and promotion system, professionalism of civil servants, electronic system development, public services improvement, transparency and accountability of the apparatus, and personnel expenditure efficiency. In order to achieve all of that, it requires the process and commitment from all employees of UIN Jakarta. â€œIt is expected that all employees in UIN Jakarta environment could improve their professionalism and responsibility in carrying out their duties and functions, and also free from collusion, corruption and nepotism in all aspects,â€ said Rudi.